Hi there! 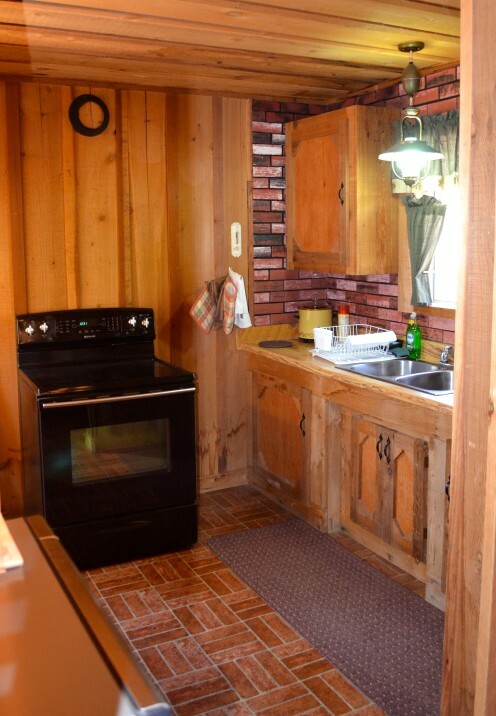 Today I’m going to show you my log cabin kitchen renovation from start to finish. 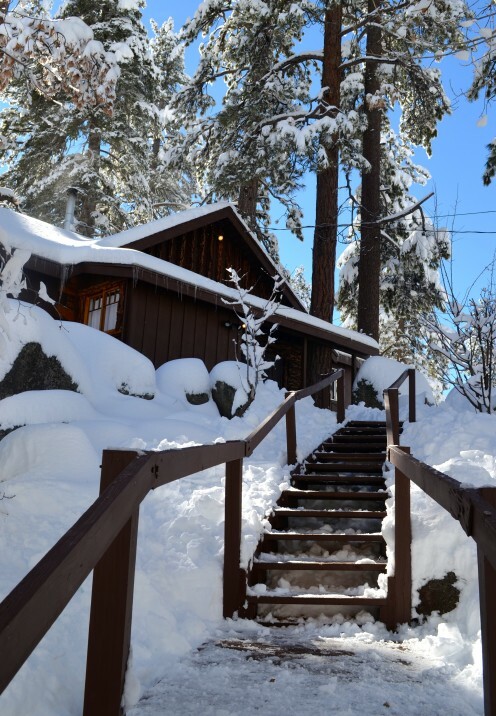 So please come with me, up the front stairs to the front door of the cabin and I’ll first show you what it looked like before it was mine. That’s the front door there in the photo below. 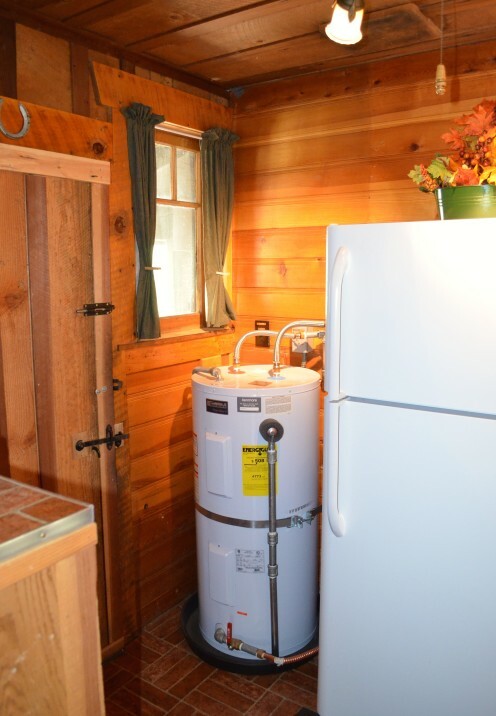 As I opened that door on my very first visit to Stone Hill Cottage, I was greeted by an exposed water heater and a refrigerator. Not a very welcoming sight. 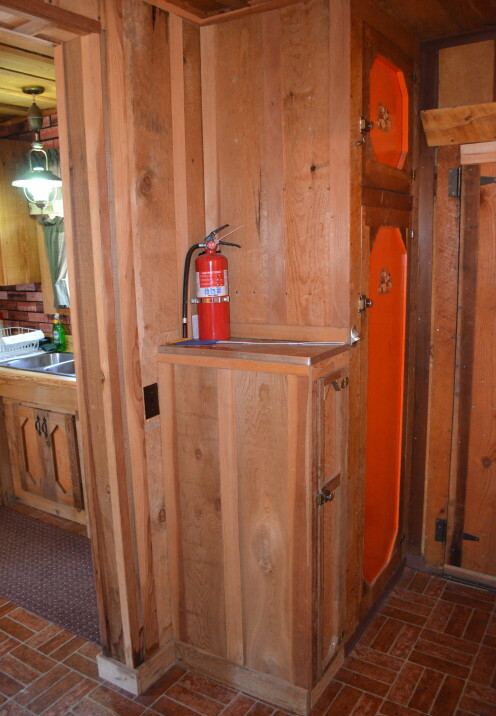 Just past the refrigerator was a built-in cabinet and saloon doors that opened into the living room beyond. 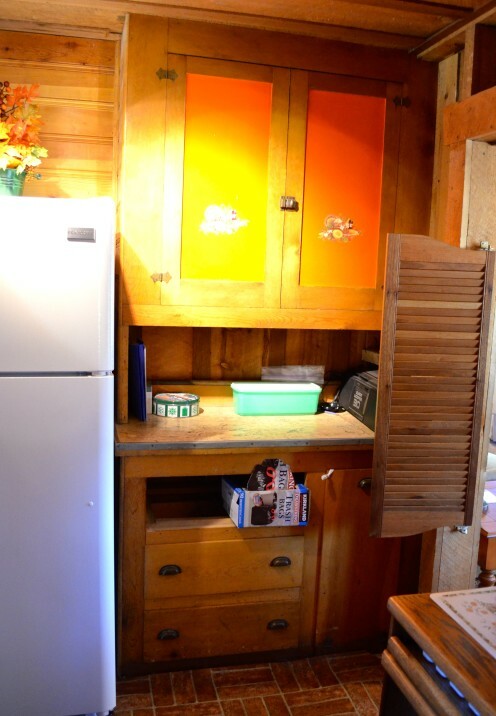 The cabinet was missing a drawer, and the countertop was made of plywood that had been covered in linoleum. On the other side of the opening into the living room the previous owners had placed what appeared to be an old media cabinet against the wall and repurposed it into a small electrical appliance repository. Garage sale chic! Venturing further into the kitchen area I found cabinets made of rough hewn wood by someone who was not a very skilled carpenter. 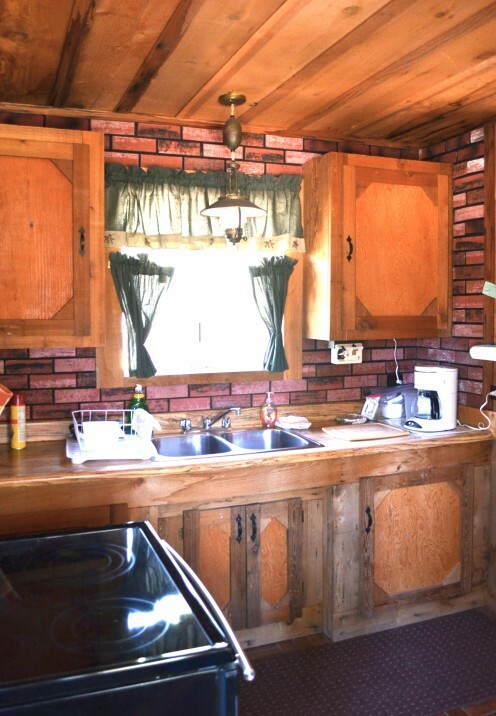 The backsplash wall was a fake brick veneer. The dated cafe curtains were threadbare and dirty. 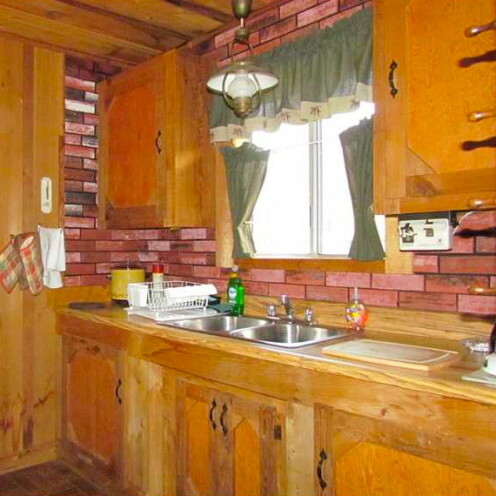 The stainless steel sink and faucet were an eyesore, as was the fake-wood, formica countertop. The only thing I thought I might salvage was the vintage, pull-down light fixture, which was kind of cute and funky in a fifties sort of way. The range was strangely placed, simply floating against the back wall. But it was brand new and looked as though it had never been used. 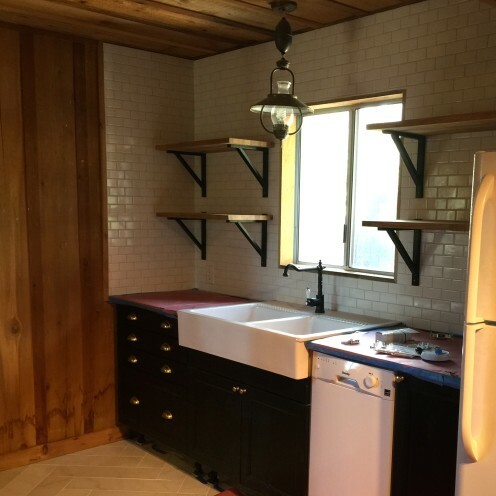 Fake brick seemed to be a theme in this kitchen’s original design, as its former owners also used fake brick linoleum on the floors. 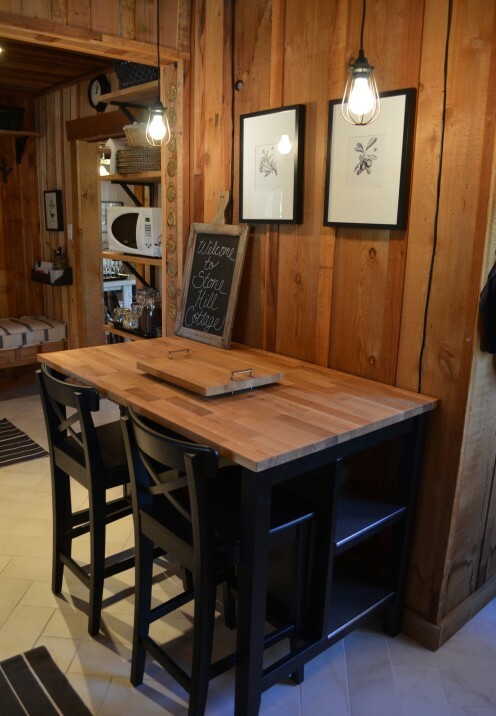 Then there was this odd little punch-out that I can only surmise must have at one time contained a small table and was used as a breakfast nook. Here again, the curtains had to go, but the light fixture had potential! However, this was the light fixture that graced the entryway. It just had to go! 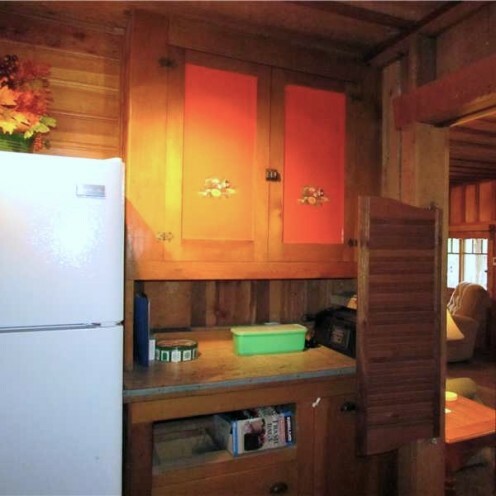 As did the wall and cabinets that separated the kitchen from the entry. 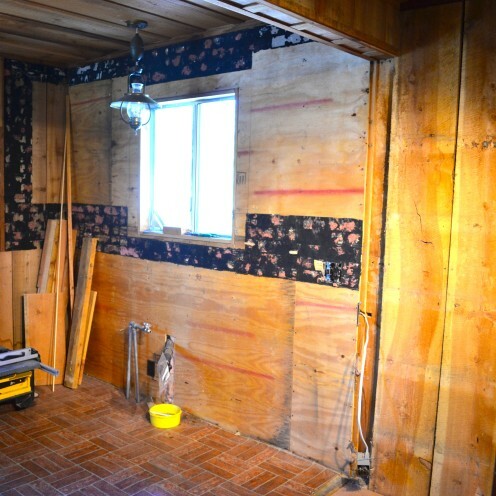 So we started the demolition process by removing the wall and cabinets you see above, making the kitchen and entryway one homogeneous and rather spacious room. 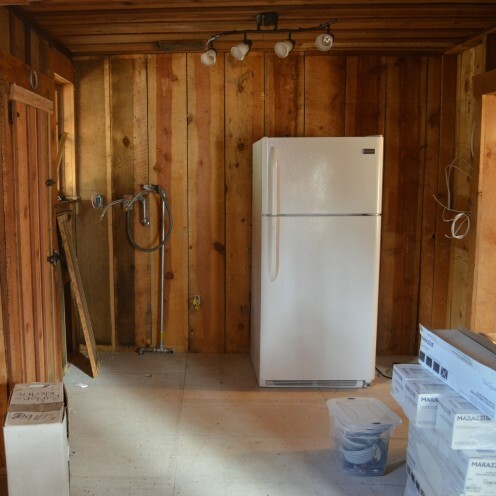 As you will see in the “after” photos, this space would become the new home for the refrigerator. The kitchen cabinets and horrible brick backsplash were also removed, giving me a clean slate from which to work. 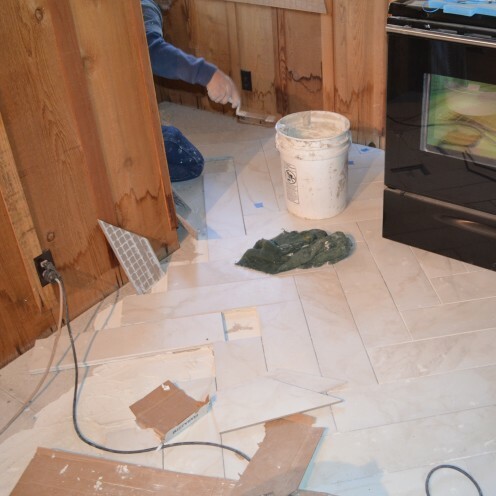 The linoleum flooring was torn out and new HardieBacker was laid, making it tile-ready. The tile I selected is called Vita Elegante Bianco from Home Depot. I decided to lay the 6″ x 24″ porcelain tiles in a herringbone pattern. The tile is made to simulate calcutta marble, and the tan colored veins running through it complement the kitchen’s wood paneled walls. They are only $2.29 a piece, a real bargain but they don’t look it at all. 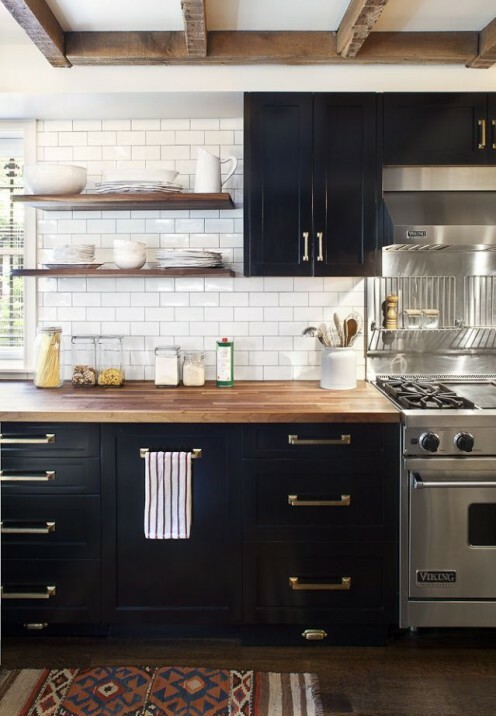 Below is a photo of a kitchen by renowned Interior Designer Blaire Harris that became my inspiration for my log cabin kitchen renovation. 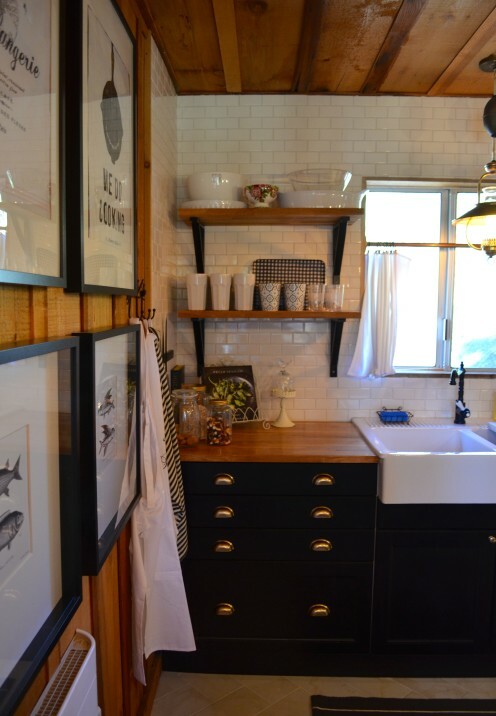 I loved the combination of black cabinets, open shelving, white subway tile and brass door pulls. 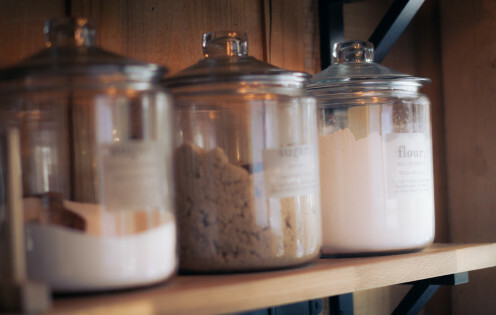 I wrote an entire blog post on the inspiration for the kitchen remodel which you can read here. 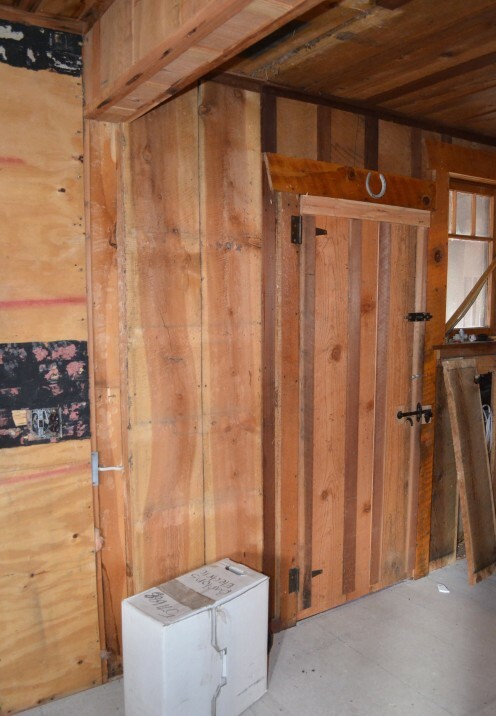 So now that I’ve shown you the kitchen and entryway of the original cabin, along with my inspiration for the remodel, let’s go back to the entryway and start over so you can see how I’ve transformed the space. 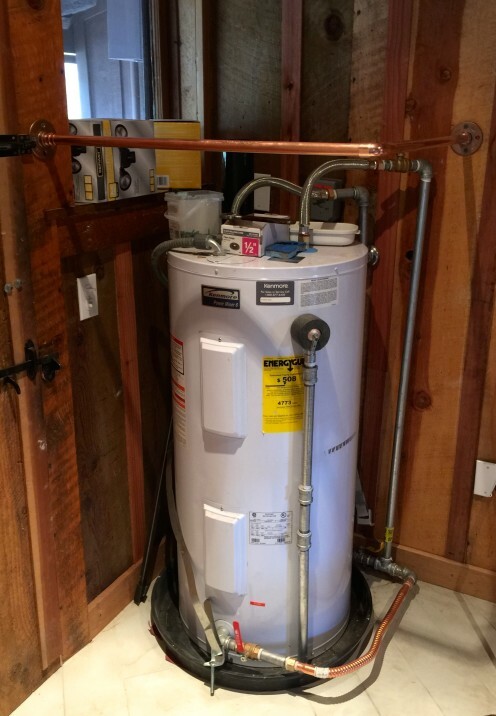 For lack of a better solution, I decided that the most practical and cost effective way to camouflage the water heater at the entryway was to curtain it off. Building a cabinet around it would impact the window which I needed for light. 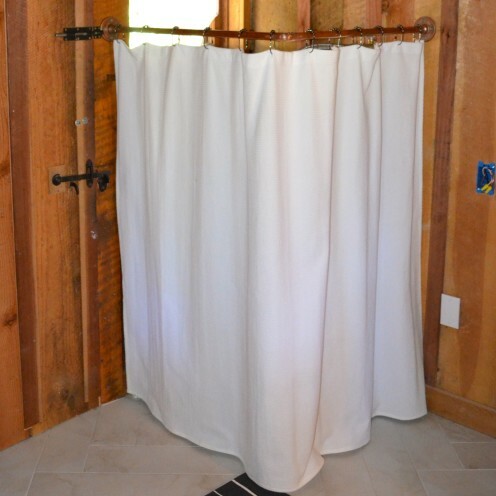 And since I had used copper pipes throughout the cabin as curtain rods, I decided to add one here and sewed a curtain to fit. A bench complete with a cushion that I sewed from fabric I purchased at a fabric outlet store. 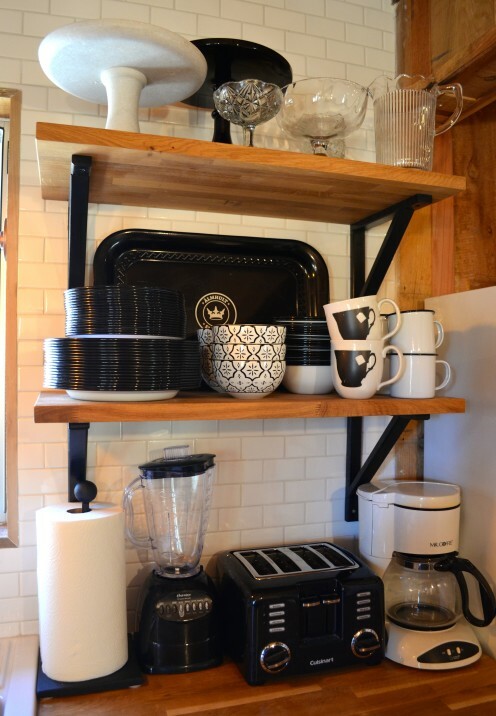 A shelf was added above the bench with storage baskets from IKEA. 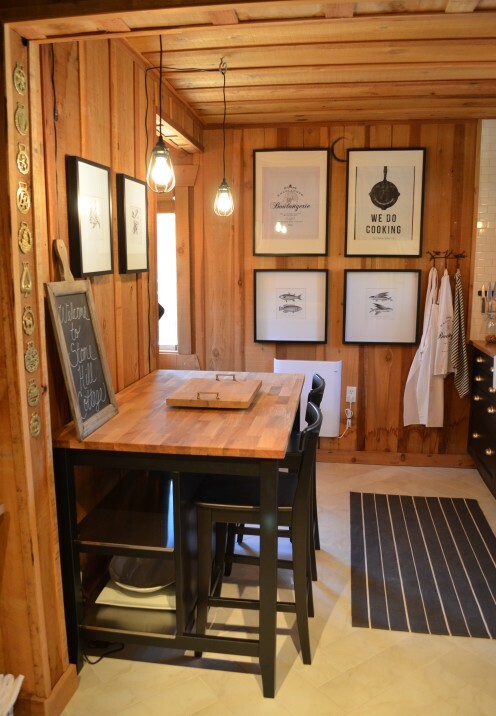 We installed wall hooks for hanging jackets and turned this area into a mudroom of sorts. 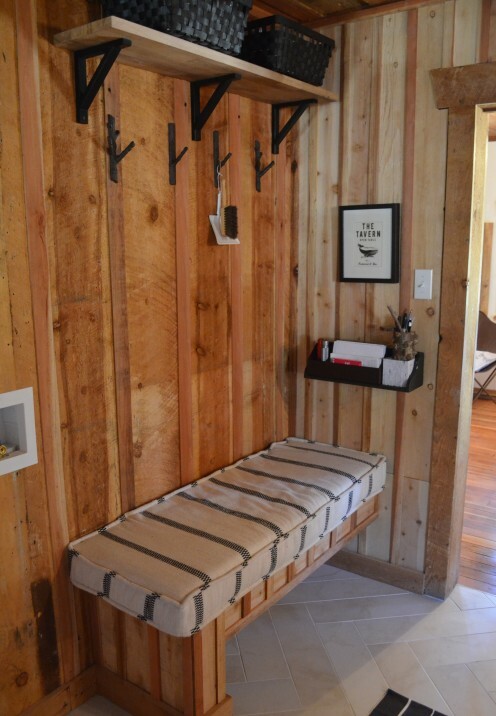 Shoes and boots can be tucked under the bench. Moving right along, you’ll remember the funky TV stand turned kitchen appliance stand. 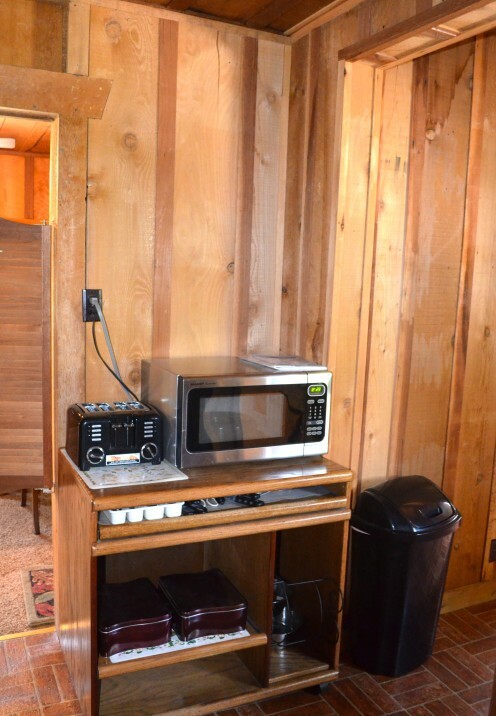 Now it not only houses a new microwave, but it also acts as a coffee and tea bar and place to store table setting supplies. Previously there was nothing on the wall that you see in the photo below. So we added an island and bar stools from IKEA. 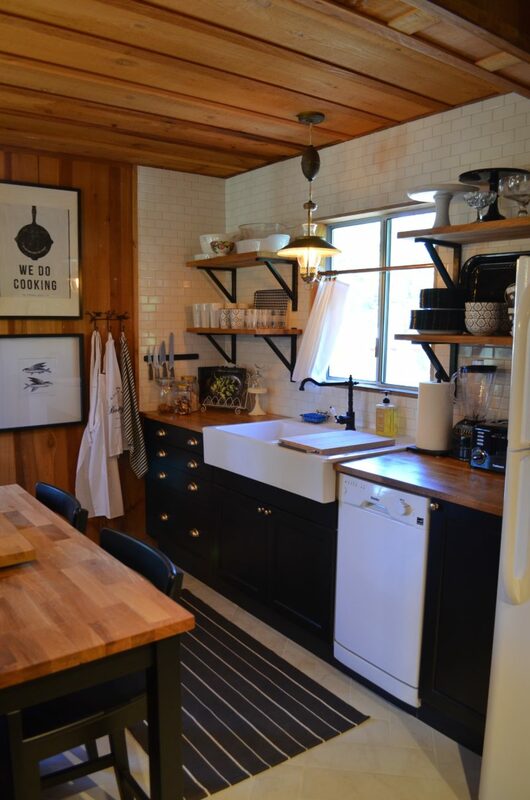 The island gives us extra storage space, can be used for food prep, and acts as a place to eat in the kitchen. The pendant lights are a combination of “metal cages” from Schoolhouse Electric found here and a very inexpensive light bulb fixture with a long cord from IKEA. 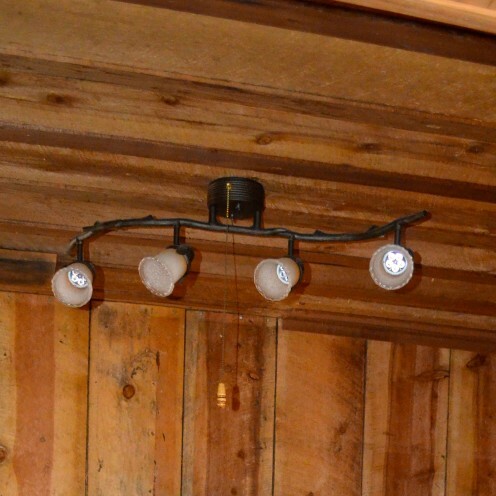 I’m kind of on a crazy roll with these caged light bulb fixtures, and have used them in several places throughout the cabin. Remember how in the original kitchen the range was floating aimlessly in the kitchen? And there was this funky nook area. Well, look what it is today! 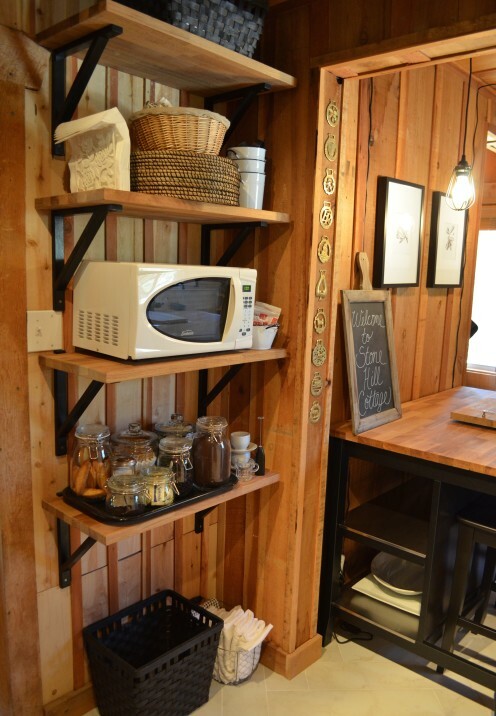 I tucked the range into this space and built it in between narrow countertops which are now a place to store herbs, spices and cooking tools. 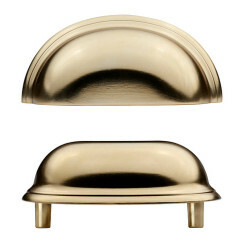 I polished the light fixture to reveal a shiny, solid brass finish below, and painted the metal shade black. 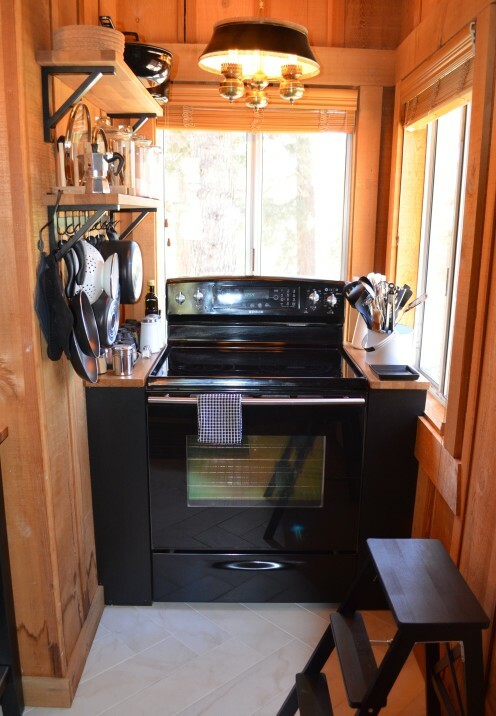 The beautiful forested view out of those windows makes cooking an absolute joy! 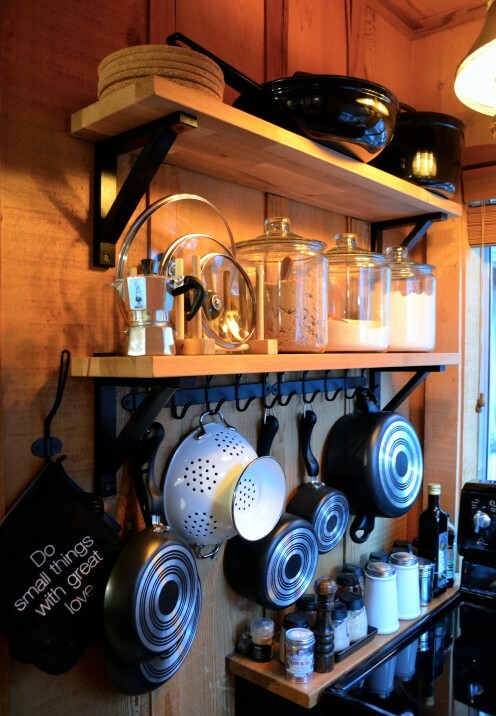 We added more open shelves and I ran hooks along the wall to hold pots and pans. I turned the back wall where the range once was into an art wall. 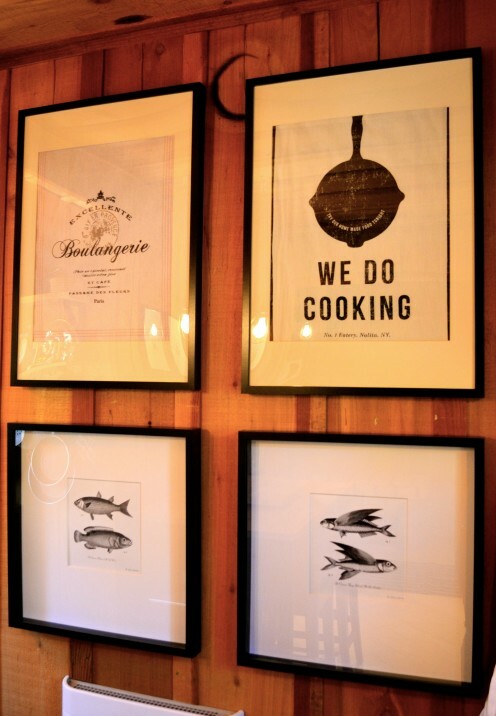 The frames are from IKEA, as are the 2 fish prints. 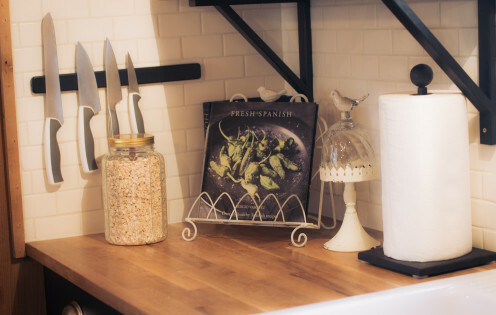 The two larger frames hold tea towels from H & M Home which are no longer available. 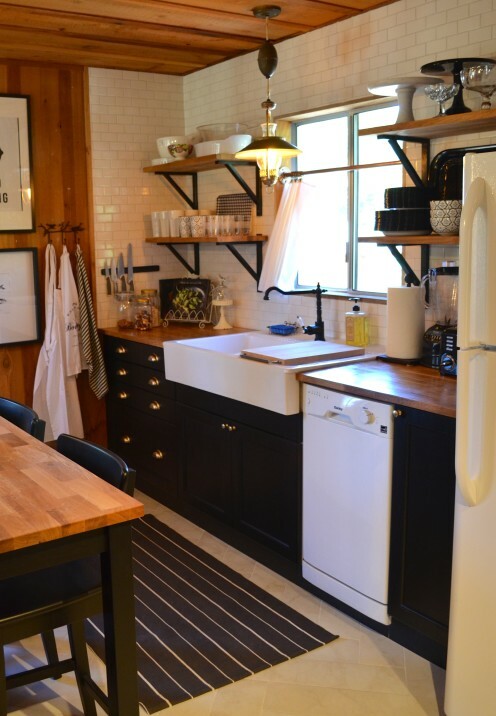 For cabinets, I selected IKEA’s new Laxarby Kitchen Cabinets in black/brown. 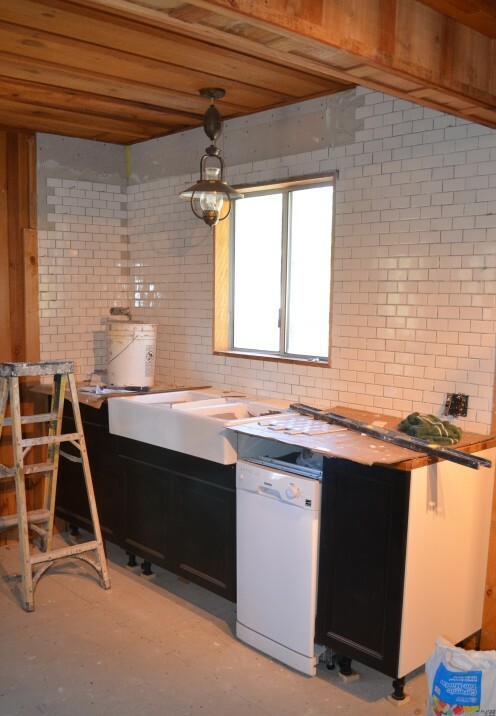 My white subway tile backsplash is fashioned from Daltile Rittenhouse Square 2″ x 4″ tiles from Home Depot at a cost of only $2.98 for a 12″ x 12″ mesh mounted mosaic. 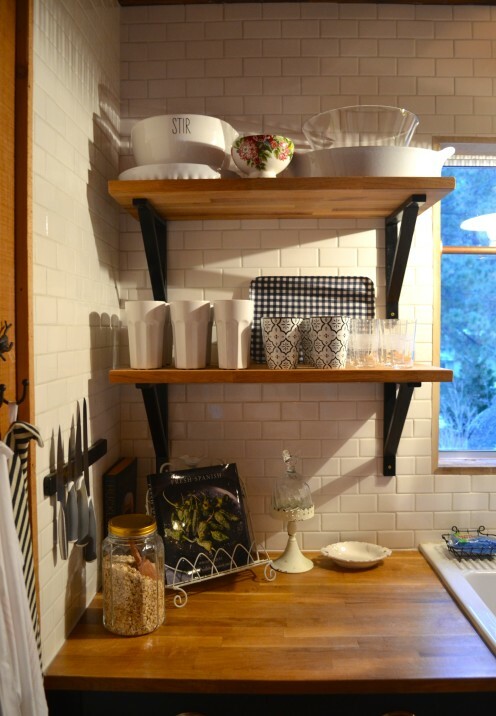 More open shelves were installed on top of the tile. 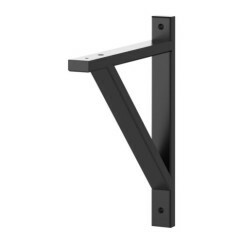 The shelf brackets come from IKEA, and the shelves were cut from the same wood used for the countertops: IKEA’s Hammarp in Oak. 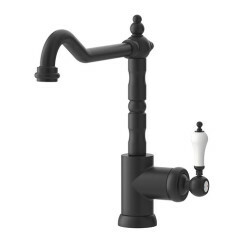 The faucet is IKEA’s Glittran: $119.00; the sink is IKEA’s Domsjo: $312.98; the drawer pulls are IKEA’s Fagleboda in brass: $7.99/2; and the shelf brackets are IKEA’s Ekby Valter: $4.00. 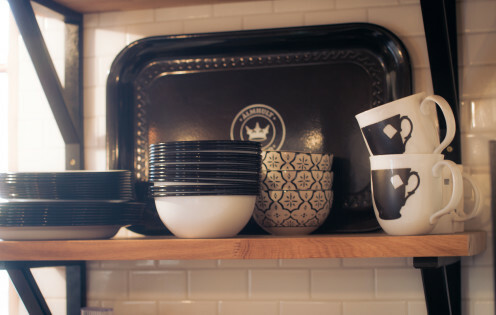 And voila, here is the kitchen as it looks today, complete with all the dishes and serving pieces. 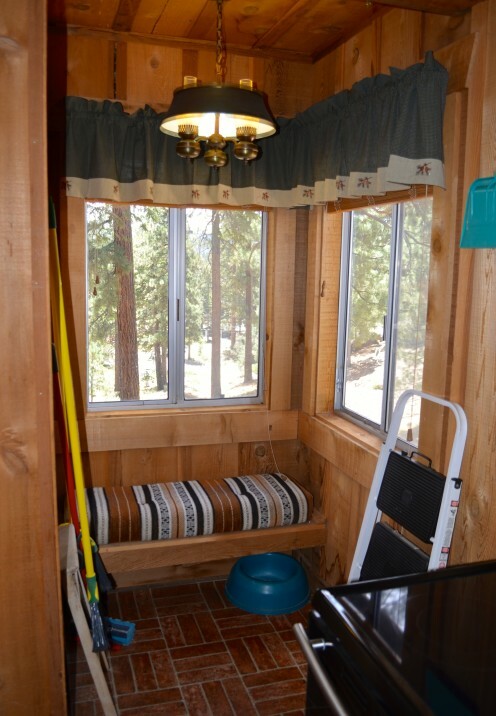 You can see that I also sewed a cafe curtain for the window that matches the one sewn to disguise the water heater. 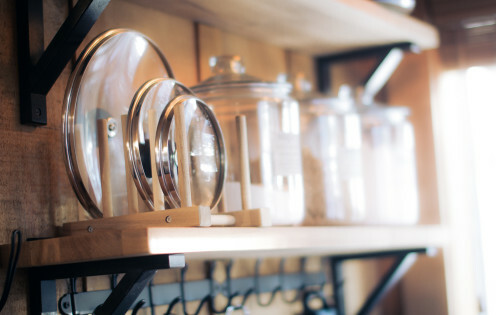 The curtain rod is fashioned from copper pipe. 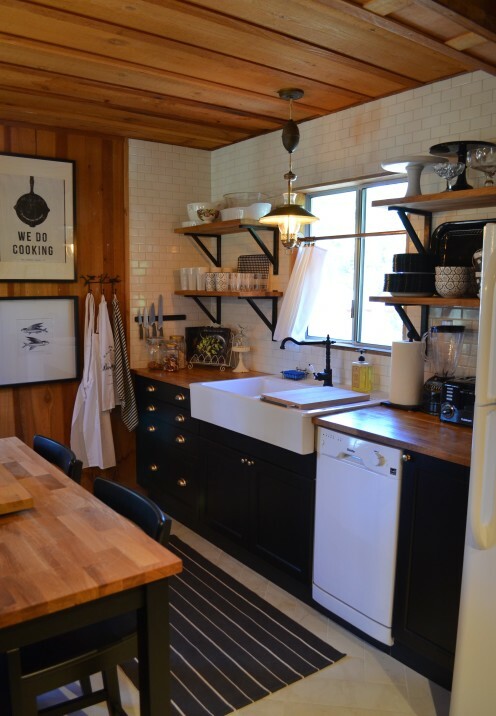 The dishwasher is only 18 inches wide so it’s perfect for a small kitchen and I’ve used this one by Danby in several cabin renovations. 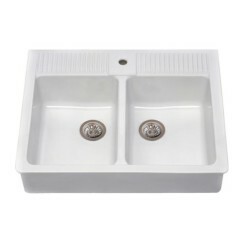 It’s on sale at Compact Appliance right now for only $389. And in case you were wondering what we did with the refrigerator, it went in the spot where there was once the wall that divided the kitchen from the entry. I hope you enjoyed the transformation. 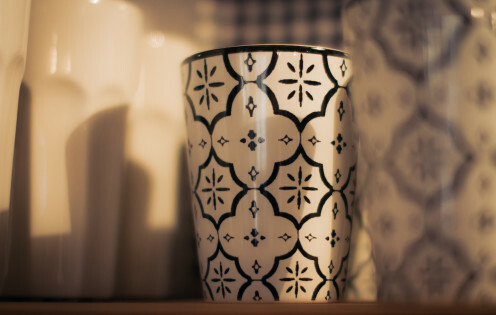 You can also see more of my kitchen renovation inspiration on my pinterest page dedicated to the renovation here. All opinions expressed in this post are my own. Unless otherwise credited, all photos are the original property of Celia Becker @ www.AfterOrangeCounty.com and may not be reproduced without specific permission. This blog post contains Affiliate Marketing Links.